In a hut on the top of a fog-licked mountain in northern Laos, Vo Pali is getting high. His poison is opium, a sap extracted from poppies grown illegally by the poor hill tribes in the Communist state's rugged, inaccessible uplands. "I smoke three times a day," the 60-year-old ethnic Hmong villager says in a barely audible rasp of his 30-year habit. "It has damaged my life. I have no income. But I get sick without it." The talk tails off as he loads up his first hit of the day. He burns a thumb-sized ball of black resin over the stub of a candle and carefully pokes it into his bamboo chillum. The flame rolls over the softened mush as Vo Pali takes four, five deep drags. Smoke squirts from his nose, he wheezes and the drug takes him. 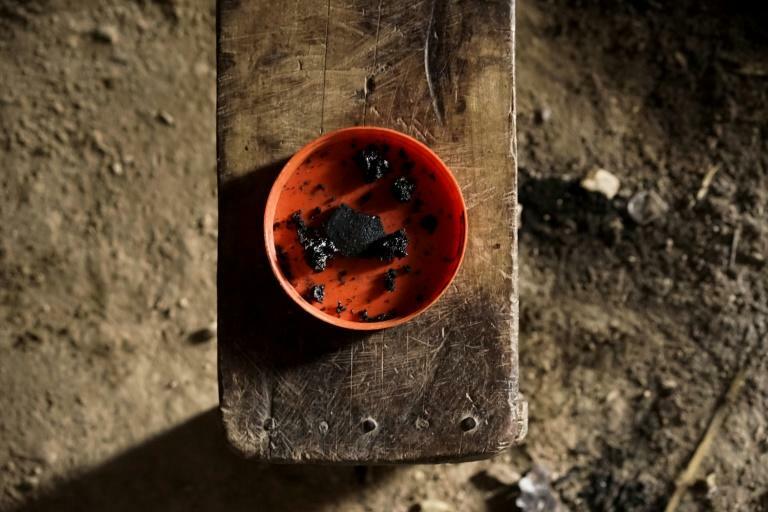 The Hmong have grown and smoked opium as a medicine -- and as recreation -- for generations. But no full drug addiction survey has ever been taken in Laos and there is virtually no rehab provision. Wedged between five countries, Laos has for decades played a starring role in the "Golden Triangle" drug trade. Its opium became a treasured export in the 1960s and 70s as heroin hit the streets of America and drug money became entwined in the United States' doomed anti-communist fight. Laos was meant to go opium-free after a 2006 edict by its Communist leadership outlawed the growing of the cash crop. While the campaign made a big dent, hill tribes kept up cultivation in secret for themselves -- and for export, also becoming drug runners for organised crime gangs. "People who live in these remote borders are very poor," Onphiuw Khongviengthong, permanent secretary of the LCDC -- the Laos drug control authority -- told AFP in a rare interview with foreign media. "They don't have much education or knowledge about our laws, so it's easy to trick them and use them for trafficking." In 2015 around 5,700 hectares (14,000 acres) of Laos were estimated to be under opium cultivation -- more than triple the amount in 2007. Several major seizures of raw opium and heroin this year in Vietnam couriered by Hmong villagers has renewed scrutiny on the relationship between opium and Laos' most marginalised people. "These farmers come from some of the poorest areas of the country, they only have access to low-value crops and very limited access to markets and technology," says Erlend Falch of the United Nations Office on Drugs and Crime (UNODC). "They have no real path out of poverty." To change the game, the UNODC is leading a coffee cultivation programme across 10 former opium growing villages in Houaphan province, which borders Vietnam. The fertile upland soil and cool climate that helps opium flourish is also good for coffee shrubs. The aim is to establish a "luxury" arabica coffee brand that can reach wealthy markets from the US to Korea and Japan. "Before we had no other option to growing opium," says Mer Su Vua, a Hmong farmer, knee-high coffee shrubs studding the hillsides around him. "But we would only make a small amount of money each year... so we have changed to coffee." The first small commercial crop at his village of Houayyarm is expected at the tail end of this year. Incomes should rise each year as farmers grow, process and sell their crop to the market, cutting out the middlemen who have historically controlled the prices of their produce. "We are trying to build a real commercial cooperative, owned by the farmers," says Falch. While opium cultivation could eventually make little economic sense, Laos' more urgent drug problem is with methamphetamine. 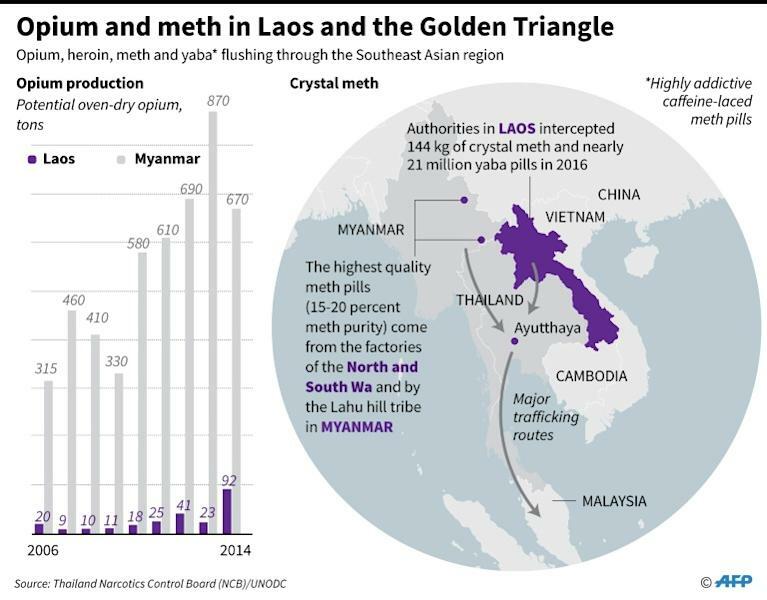 With ungovernable land borders to Myanmar, Thailand, Vietnam, China and Cambodia, Laos is effectively a free run for the meth barons of Myanmar who are sending record amounts of "yaba" and "ice" through its unguarded frontiers. Of Laos' many border entry points, just two have scanners and X-ray machines. And the resources of the drug gangs dwarf those of the police trying to stop them, says Onphiuw Khongviengthong of the LCDC. "They use fast, modern vehicles and communications that our police do not have." Laos is working with its neighbours to boost crossborder intelligence to fight the drug gangs and there have been successes, including the high-profile takedown of Laos national Xaysana Keophimpa -- dubbed "Mr X" -- jailed for life this year in Thailand. But the "big fish" remain out of reach. In January the US Treasury sanctioned Chinese-businessman Zhao Wei for allegedly running a regional criminal enterprise -- including trafficking of wildlife, humans and drugs -- through the Kings Roman casino in a Special Economic Zone in the Laotian part of the Golden Triangle. Zhao Wei is virtually untouchable inside the SEZ, running his own security in an area whose 99-year lease terms bar Laos authorities from intruding. Curled up -- almost childlike -- in his shack as the waves of opium strike him, Vo Pali makes an unlikely link in a global criminal chain. But the cycle of addiction keeps opium farmers in business. "My biggest regret is that my son is now also an addict," he says in a moment of clarity, before drifting off cradling his pipe.